Narrative: At 4:54 p.m. Saturday, March 13, 2010, seven companies of Tacoma firefighters – 4 Engines, 1 Ladder, 1 Medic Unit and Command Staff responded to a reported structure fire at 1211 Alexander Ave.
First arriving companies found flames and smoke showing from the side and rear of the 1 story mobile home smoke shop. Crews attacked the fire with hand lines, worked around downed live power lines and prevented the fire from spreading to an adjacent fireworks stand and a nearby house. Crews were able to contain the fire to the smoke shop and there were no injuries to report. The cause of the fire is currently under investigation. Tacoma Fire Department would like to remind everyone that when you change your clocks tonight for daylight savings time, be sure to change the batteries in your home's smoke alarms as well. When smoke alarms fail, it is usually because batteries are missing, disconnected or dead. Smoke alarms that are properly installed and maintained play a vital role in reducing fire deaths and injuries. For more information about installing and maintaining smoke alarms visit the National Fire Protection Association or United States Fire Administration. Incident Location: 1801 E. 56th St. Narrative: At 4:02 p.m. Friday, March 12, 2010, 3 companies of Tacoma Firefighters – 1 Engine (E-15), 1 Ladder, (E-2) 1 Medic Unit (M-5) and Command Staff (B-2) responded to the 1801 E. 56th Street for a one car roll over motor vehicle crash. 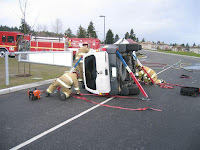 First arriving companies found one patient trapped inside a rolled over sports utility vehicle. 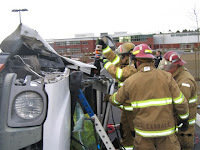 Crews quickly assembled a stabilization system to protect the patient from injury and used hydraulic tools to cut the top of the car off to safely remove the occupant. Fortunately, the patient was able to walk away from the incident once freed.